Den Yer Don't Get Stuck-See? Copyright, 1886, by Alb. H. Fitz. Words And Music by Alb. H. Fitz. "What's de matter, now, Chimmie? Why, don't yer go home to bed?" "l's afraid to go home, Pa'll lick me if I doesn't sell out." he said. To-morrer yer sells Journals, and yer don't git stuck den-see?" I's sold enough for both, so we'll go home by and by. By ten he'd sold every paper: "That'll do," said he, "for to-day." Regretting his loss of the morning, and almost ready to cry. Come over to de wagon, you can eat on me. 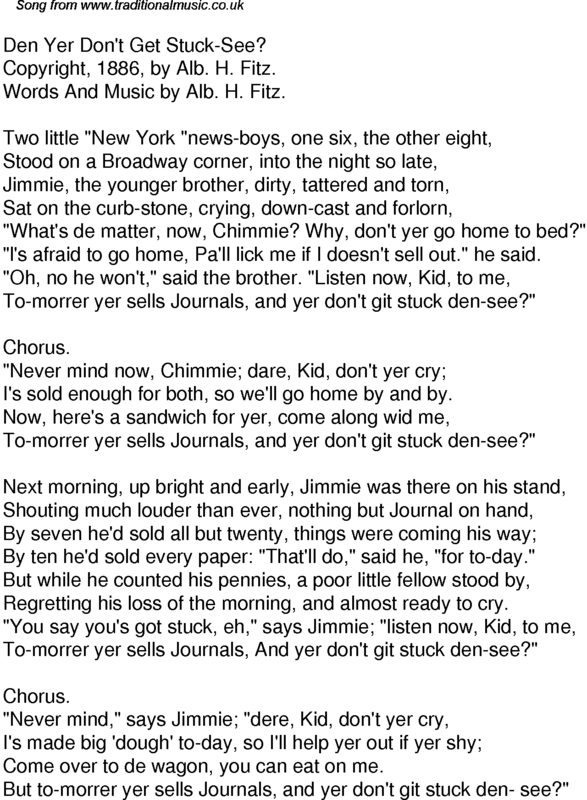 But to-morrer yer sells Journals, and yer don't git stuck den- see?"